The Bear Creek trail is located in Telluride, Colorado. 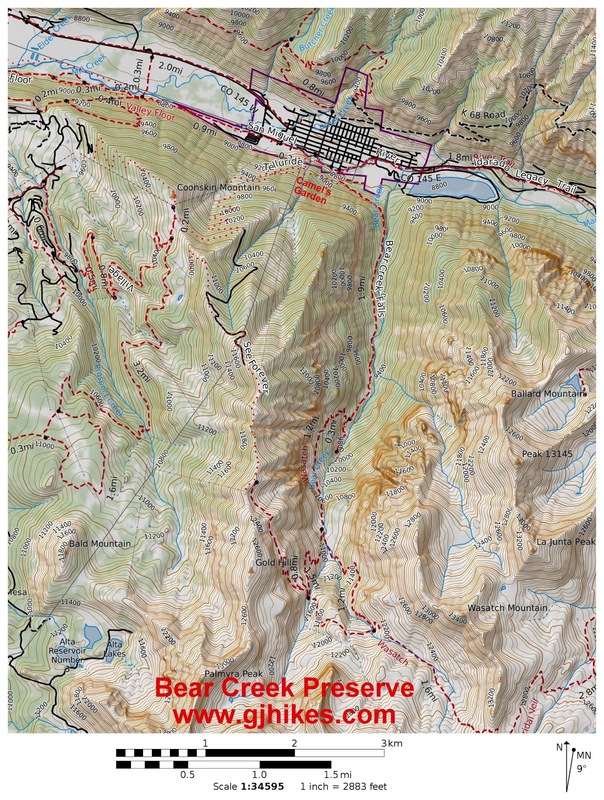 The trail begins in the Bear Creek Preserve where after a short distance it enters the Uncompahgre National Forest. From there the trail continues up Bear Creek following an old road to around the 2 mile point where it is met by the Wasatch trail which branches off on the right. The Bear Creek trail continues for another 2 tenths of a mile or so to the base of a scenic waterfall. To get to the trailhead find your way to the end of South Pine Street where it will be on your left. After a few hundred feet the trail passes the spot where the Camel's Garden trail branches off on the right. The lower part of the trail is well sheltered by trees on both sides of the road. An open area with a large flat rock displays a multitude of 'Prayer Stones' left by previous hikers. If you want to add your own cairn be sure to find your own rocks rather than taking them from the piles that are already there. The jagged ridges and peaks on the Ballard Mountain (12,804 feet) side of the valley provide a dazzling picture that is hard to photograph in the morning light yet incredible to view in person. It is an uphill hike for the entire length of the trail. The grade stays easy to moderate but those that are less fit might think otherwise. With such enjoyable surroundings there is no reason to hurry. Near the 2 mile point the Wasatch trail splits off on the right. Glimpses of the falls have already come into view by this point making it pretty easy to know that you need to take the left fork to get there. The road ends at a very large boulder that is near the creek. A singletrack begins at this point that leads the rest of the way up to the falls. The singletrack trail is pretty primitive and a little steep in places. If it becomes too difficult you can still enjoy some nice views of the falls from a few hundred yards away without hiking all the way up to it. Of course, for the best view hiking all the way to the end is well worth the effort. It can get a little crowded around the falls so try to be sensitive of others by moving off to the side after getting your pictures. It is all downhill back to the trailhead making the return trip a bit easier. There isn't any public parking at the trailhead so you will need to factor in the extra distance from wherever you are staying. It is about a half mile from the closest free parking lot in Telluride. All you have to do is follow the River trail to Pine Street and then go to your right. 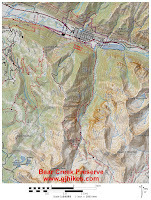 The Bear Creek trail is one of the most popular hiking trails in Telluride and tends to get very busy on weekends. If you would like to see it for yourself then all you have to do is 'Take a hike'.